We are thankful to numerous families who have helped sponsor satsangs and festivals at the temple during 2019. Please support the temple by picking a date from below for sponsoring a satsang during 2019. Board Members are available to provide you any guidance needed in sponsoring a satsang at the temple. You may contact Prabha Ravi (269-808-6394) or any Board Member for help. You are cordially invited to a special satsang on Sunday, April 28, 2019 to commemorate Temple Anniversary, and to recognize IACCT Life Members. IACCT Life Members have made significant contributions to the temple with their generous support. Board is very pleased to dedicate the anniversary satsang to recognize and honor them. 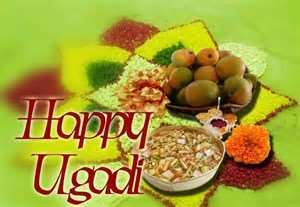 IACCT will celebrate Ugadi/Gudhi Padwa - the Hindu New Year day on Saturday, April 6, 2019. The program will begin with a pooja in the Temple at 6:30 PM followed by bhajans, archana, arati and dinner prasadam. 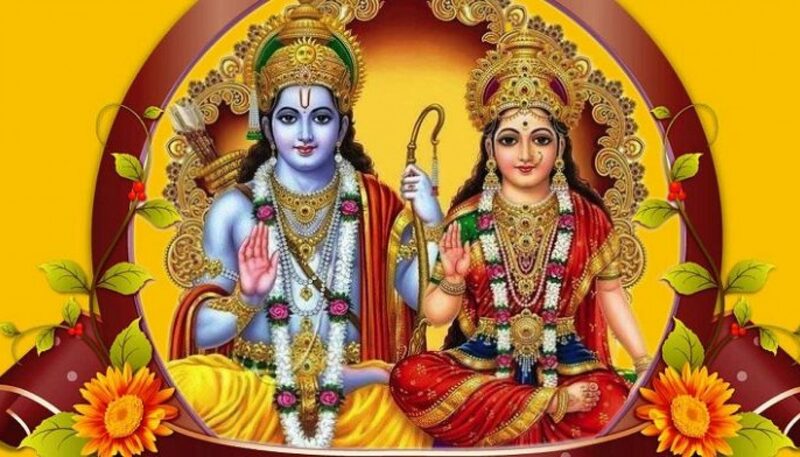 IACCT will celebrate Rama Navami during April 6, 2019 to April 14, 2019. Please join the celebration of the birth of Lord Rama during the nine-day period. There will be Lord Rama pooja every evening at 6:30 PM. 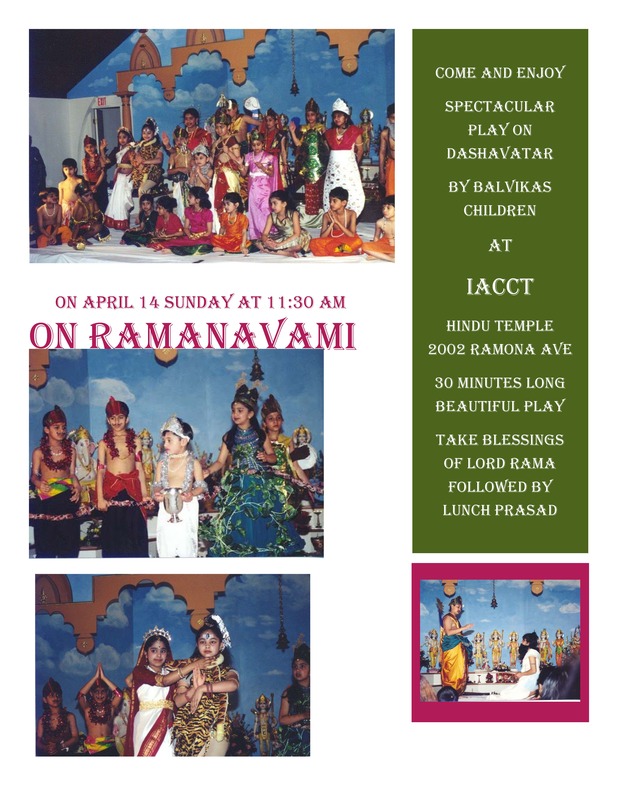 On Rama Navami day, Sunday, April 14, 2019 there will be pooja beginning at 11:30 AM, a skit by Balvikas children (see flyer), bhajans, archana, and arati, followed by lunch prasadam. Come and enjoy spectacular play on Dashavatar by Balvikas children at temple 30 minutes long play. Take blessings of lord Rama, followed by Lunch prasad. Regional Contest for K-12th graders. Registration at North South Foundation (www.northsouth.org) by April 14, 2019. Contact Tarun Gupta (guptat57@yahoo.com or 269-276-3361 or 269-352-3021). Per NSF rules, on-site registration is not allowed. The 2019 National Finals will be held from August 9 through August 11 at Massachusetts Institute of Technology (MIT), MA. As you may know, your annual membership dues are an essential part of operating budget of the temple. Without your membership support, the temple cannot provide ongoing services for everyone. Annual membership dues pay for one calendar year. For 2019, we have received membership from over 75 families so far. Please support the temple by sending a check for your annual taxdeductible membership for 2019. We are pleased to announce that iOS app for IACCT is avaialable on Apple App store for Free download ! Search 'IACCT' on the app store and download it.